After performing a study, you can correctly conclude there is an effect or not, but you can also incorrectly conclude there is an effect (a false positive, alpha, or Type 1 error) or incorrectly conclude there is no effect (a false negative, beta, or Type 2 error). The goal of collecting data is to provide evidence for or against a hypothesis. Take a moment to think about what ‘evidence’ is – most researchers I ask can’t come up with a good answer. 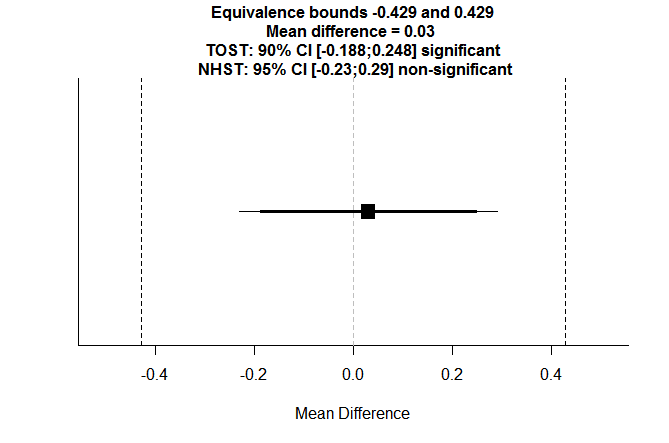 For example, researchers sometimes think p-values are evidence, but p-values are only correlated with evidence. Evidence in science is necessarily relative. When data is more likely assuming one model is true (e.g., a null model) compared to another model (e.g., the alternative model), we can say the model provides evidence for the null compared to the alternative hypothesis. P-values only give you the probability of the data under one model – what you need for evidence is the relative likelihood of two models. Bayesian and likelihood approaches should be used when you want to talk about evidence, and here I’ll use a very simplistic likelihood model where we compare the relative likelihood of a significant result when the null hypothesis is true (i.e., making a Type 1 error) with the relative likelihood of a significant result when the alternative hypothesis is true (i.e., *not* making a Type 2 error). Let’s assume we have a ‘methodological fetishist’ (Ellemers, 2013) who is adamant about controlling their alpha level at 5%, and who observes a significant result. Let’s further assume this person performed a study with 80% power, and that the null hypothesis and alternative hypothesis are equally (50%) likely. 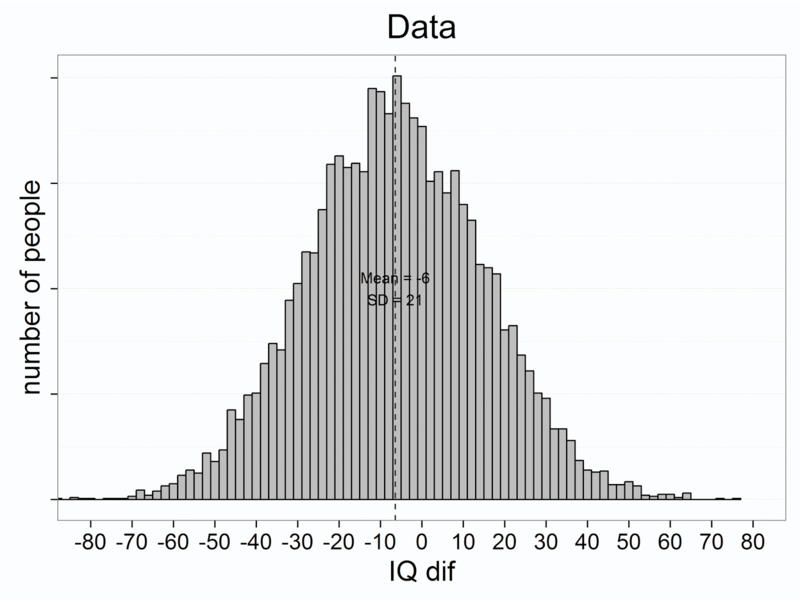 The outcome of the study has a 2.5% probability of being a false positive (a 50% probability that the null hypothesis is true, multiplied by a 5% probability of a Type 1 error), and a 40% probability of being a true positive (a 50% probability that the alternative hypothesis is true, multiplied by an 80% probability of finding a significant effect). The relative evidence for H1 versus H0 is 0.40/0.025 = 16. In other words, based on the observed data, and a model for the null and a model for the alternative hypothesis, it is 16 times more likely that the alternative hypothesis is true than that the null hypothesis is true. For educational purposes, this is fine – for statistical analyses, you would use formal likelihood or Bayesian analyses. Now let’s assume you agree that providing evidence is a very important reason for collecting data in an empirical science (another goal of data collection is estimation – but I’ll focus on hypothesis testing here). We can now ask ourselves what the effect of changing the Type 1 error or the Type 2 error (1-power) is on the strength of our evidence. And let’s agree that we will conclude that whichever error impacts the strength of our evidence the most, is the most important error to control. Deal? So when is the evidence in our data the strongest? Not surprisingly, this happens when both types of errors are low: the alpha level is low, and the power is high (or the Type 2 error rate is low). That is why statisticians recommend low alpha levels and high power. Note that the shape of the plot remains the same regardless of the relative likelihood H1 or H0 is true, but when H1 and H0 are not equally likely (e.g., H0 is 90% likely to be true, and H1 is 10% likely to be true) the scale on the likelihood ratio axis increases or decreases. Now for the main point in this blog post: we can see that an increase in the Type 2 error rate (or a reduction in power) reduces the evidence in our data, but it does so relatively slowly. However, we can also see that an increase in the Type 1 error rate (e.g., as a consequence of multiple comparisons without controlling for the Type 1 error rate) quickly reduces the evidence in our data. Royall (1997) recommends that likelihood ratios of 8 or higher provide moderate evidence, and likelihood ratios of 32 or higher provide strong evidence. Below 8, the evidence is weak and not very convincing. If we calculate the likelihood ratio for alpha = 0.05, and power from 1 to 0.1 in steps of 0.1, we get the following likelihood ratios: 20, 18, 16, 14, 12, 10, 8, 6, 4, 2. 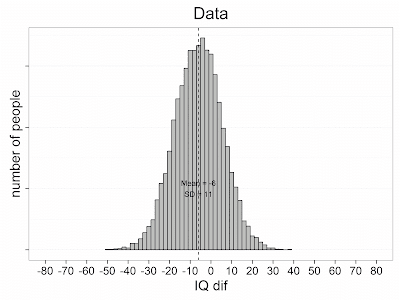 With 80% power, we get the likelihood ratio of 16 we calculated above, but even 40% power leaves us with a likelihood ratio of 8, or moderate evidence (see the figure above). If we calculate the likelihood ratio for power = 0.8 and alpha levels from 0.05 to 0.5 in steps of 0.05, we get the following likelihood ratios: 16, 8, 5.3, 4, 3.2, 2.67, 2.29, ,2, 1.78, 1.6. An alpha level of 0.1 still yields moderate evidence (assuming power is high enough!) but further inflation makes the evidence in the study very weak. To conclude: Type 1 error rate inflation quickly destroys the evidence in your data, whereas Type 2 error inflation does so less severely. Type 1 error control is important if we care about evidence. Although I agree with Fiedler, Kutzner, and Kreuger (2012) that a Type 2 error is also very important to prevent, you simply can not ignore Type 1 error control if you care about evidence. Type 1 error control is more important than Type 2 error control, because inflating Type 1 errors will very quickly leave you with evidence that is too weak to be convincing support for your hypothesis, while inflating Type 2 errors will do so more slowly. By all means, control Type 2 errors - but not at the expense of Type 1 errors. But this is only true if the sample size is fixed. If you want to reduce both errors, you simply need to increase your sample size, and you can make Type 1 errors and Type 2 errors are small as you want, and contribute extremely strong evidence when you collect data. Royall, R. (1997). 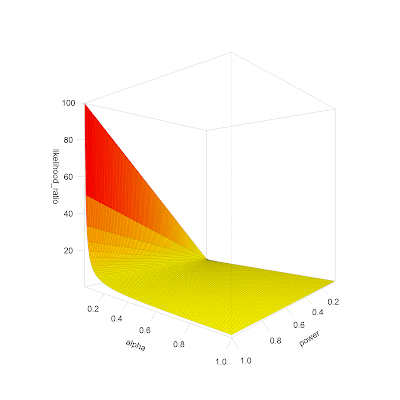 Statistical Evidence: A Likelihood Paradigm. London ; New York: Chapman and Hall/CRC. The “/2” part of the equation is due to the fact that in a two-condition within design every participant provides two data-points. The extent to which this reduces the sample size compared to a between-subject design depends on the correlation between the two dependent variables, as indicated by the (1-ρ) part of the equation. 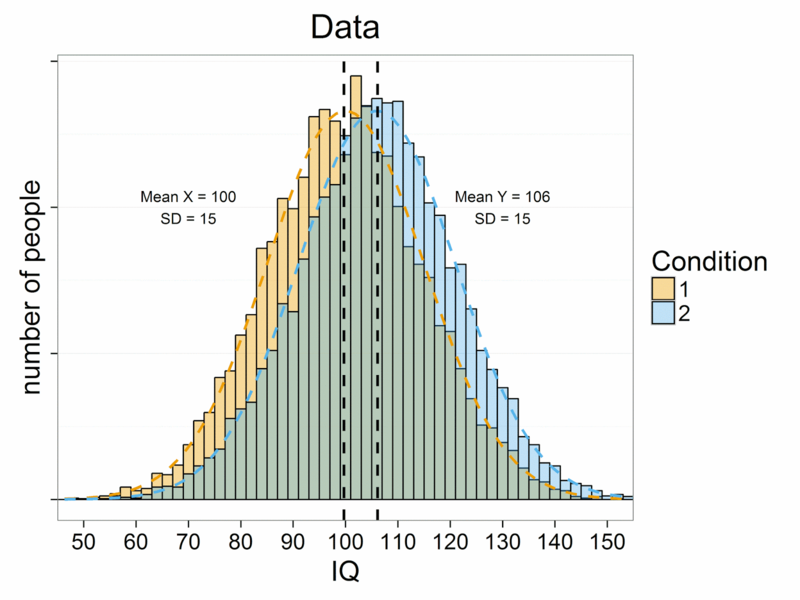 If the correlation is 0, a within-subject design simply needs half as many participants as a between-subject design (e.g., 64 instead 128 participants). 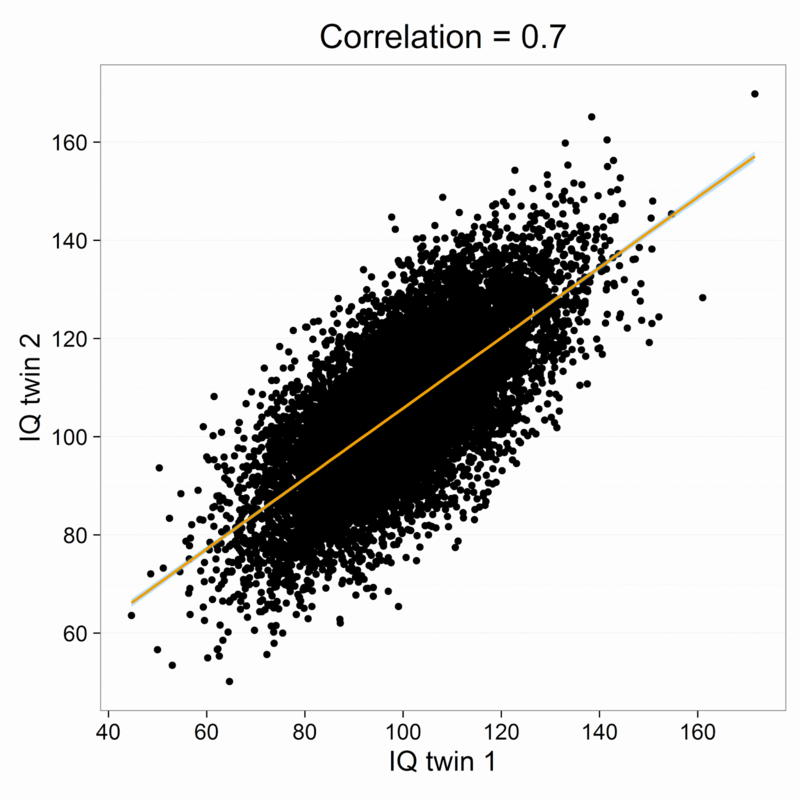 The higher the correlation, the larger the relative benefit of within designs, and whenever the correlation is negative (up to -1) the relative benefit disappears. 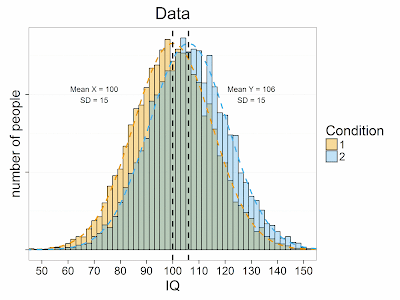 Note than when the correlation is -1, you need 128 participants in a within-design and 128 participants in a between-design, but in a within-design you will need to collect two measurements from each participant, making a within design more work than a between-design. 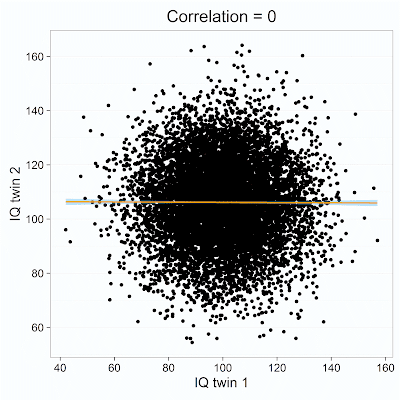 However, negative correlations between dependent variables in psychology are rare, and perfectly negative correlations will probably never occur. So what does the correlation do so that it increases the power of within designs, or reduces the number of participants you need? Let’s see what effect the correlation has on power by simulating and plotting correlated data. 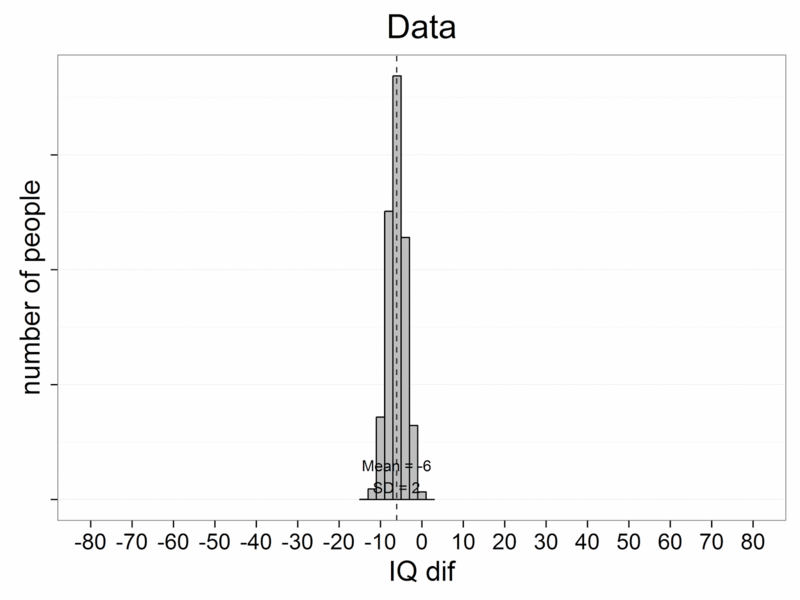 In the R script below, I’m simulating two measurements of IQ scores with a specific sample size (i.e., 10000), mean (i.e., 100 vs 106), standard deviation (i.e., 15), and correlation between the two measurements. The script generates three plots. We will start with a simulation where the correlation between measurements is 0. 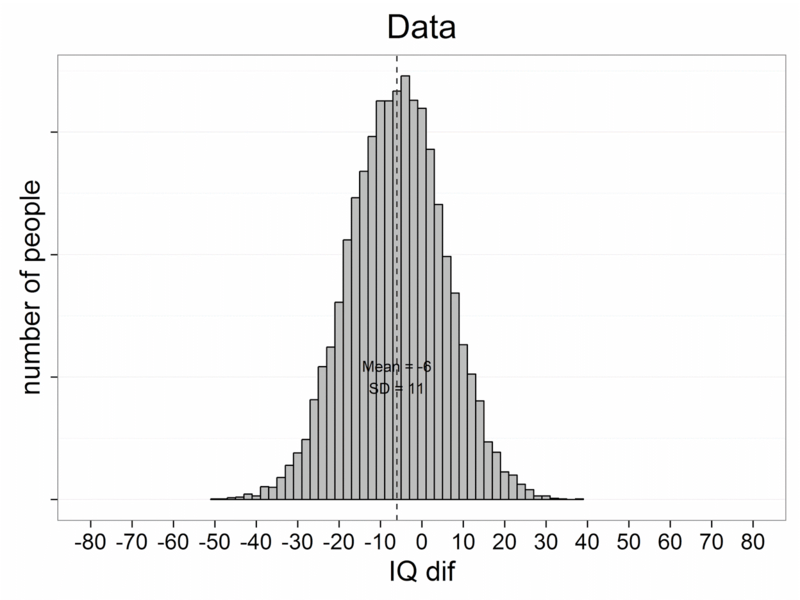 First, we see the two normally distributed IQ measurements, with means of 100 and 106, and standard deviations of 15 (due to the large sample size, the numbers equal the input in the simulation, although small variation might still occur). 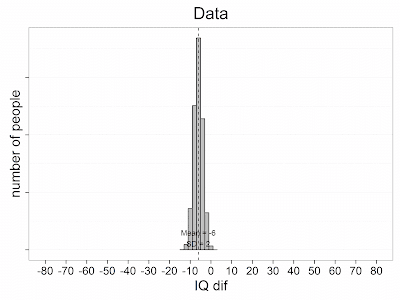 In the scatter plot, we can see that the correlation between the measurements is indeed 0. Now, let’s look at the distribution of the mean differences. The mean difference is -6 (in line with the simulation settings), and the standard deviation is 21. This is also as expected. The standard deviation of the difference scores is √2 times as large as the standard deviation in each measurement, and indeed, 15*√2 = 21.21, which is rounded to 21. 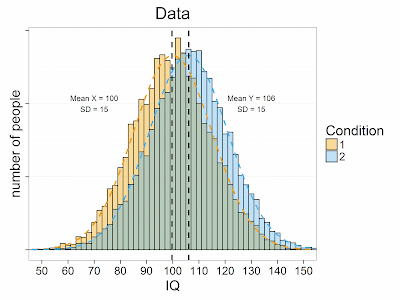 This situation where the correlation between measurements is zero equals the situation in an independent t-test, where the correlation between measurements is not taken into account. Now let’s increase the correlation between dependent variables to 0.7. 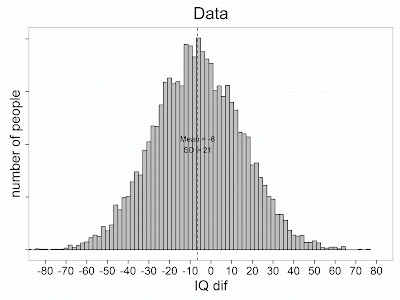 The important difference lies in the standard deviation of the difference scores. The SD = 11 instead of 21 in the simulation above. Because the standardized effect size is the difference divided by the standard deviation, the effect size (Cohen’s dz in within designs) is larger in this test than in the test above. 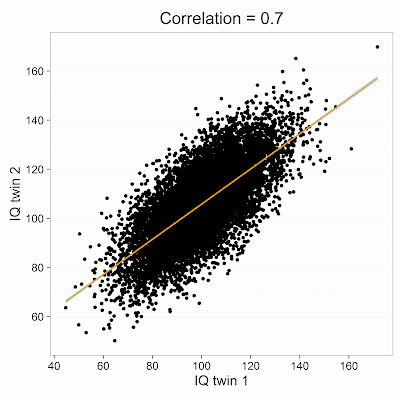 We can make the correlation more extreme, by increasing the correlation to 0.99, after which the standard deviation of the difference scores is only 2. If you run the R code below, you will see that if you set the correlation to a negative value, the standard deviation of the difference scores actually increases. I like to think of dependent variables in within-designs as dance partners. If they are well-coordinated (or highly correlated), one person steps to the left, and the other person steps to the left the same distance. If there is no coordination (or no correlation), when one dance partner steps to the left, the other dance partner is just as likely to move to the wrong direction as to the right direction. Such a dance couple will take up a lot more space on the dance floor. You see that the correlation between dependent variables is an important aspect of within designs. 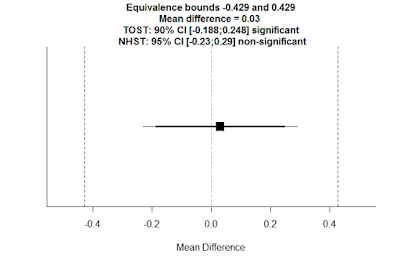 I recommend explicitly reporting the correlation between dependent variables in within designs (e.g., participants responded significantly slower (M = 390, SD = 44) when they used their feet than when they used their hands (M = 371, SD = 44, r = .953), t(17) = 5.98, p < 0.001, Hedges' g = 0.43, Mdiff = 19, 95% CI [12; 26]). 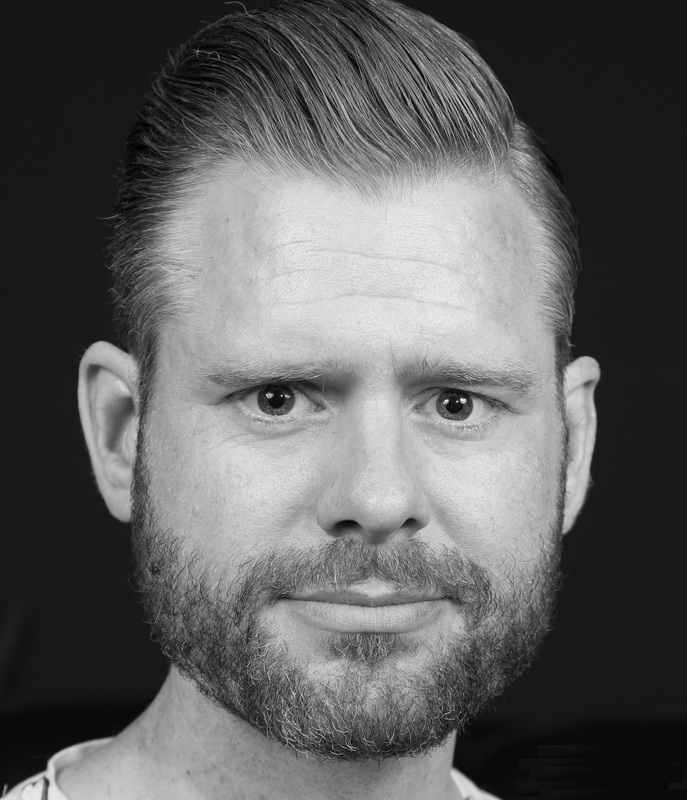 Since most dependent variables in within designs in psychology are positively correlated, within designs will greatly increase the power you can achieve given the sample size you have available. Use within-designs when possible, but weigh the benefits of higher power against the downsides of order effects or carryover effects that might be problematic in a within-subject design. Maxwell and Delaney's book (Chapter 11) has a good discussion of this topic. Maxwell, S. E., & Delaney, H. D. (2004). Designing experiments and analyzing data: a model comparison perspective (2nd ed). Mahwah, N.J: Lawrence Erlbaum Associates.